The FMI Sierrita Filter Expansion project involved building a new structure, feed tank and thickener for a new Outotec LAROX filter press rated at 100 TPH. Construction of this project had to be coordinated and scheduled around the existing mine operations without disrupting production. Wilson Electric crews had to be vigilant and flexible enough to have work stopped any time production priorities demanded, as well as scheduling required outages well in advance to accommodate the facility operations. The 7.2kv feed for the new filter had to be routed through the existing ball mill building which required some difficult scaffold work to install the new cable tray and MV feeders. 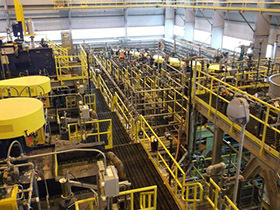 The FMI Morenci New Moly Plant addition was a seven month, fast-track project completed in December of 2014. The project presented a wide range of challenges. 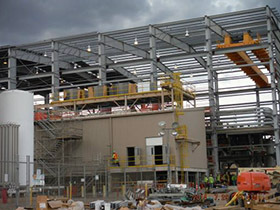 The project involved installing 6,000 feet of cable tray, 32,000’ of rigid conduit, 1,000,000 feet of cable, connection of 2,215 instruments, and the install of a double ended 5,000 switchboard with 6 MCC’s feeding 346 different loads. Wilson Electric began the project with just the slab on grade completed in July of 2014 and 87,000 hours later was in the start up phase. The challenges of working at heights with very little access from below, extremely tight spaces with the entire structure being rapidly filled with steel, piping and equipment on a daily basis were all successfully met by the Wilson Electric crews. The team developed a number of unique strategies to navigate the close confines of the mill, such as a custom pulley system for pulling cable around heavy, sometimes high voltage equipment.